Surely you meant 61 to 62 degrees? I was at Highpoint (back of cove) Tuesday afternoon to dusk and I was seeing 62 to 64. If you were seeing 51 to 52 one of us needs to get our temperature sensor calibrated (lol). Thanks for sharing your pic! Awesome haul VJMAC! I would love to hear a bit more about your trip to Lake D'Arbonne. It's on my bucket list now. I retire this fall and want to make a southern run next spring. I fish from a kayak and this lake looks perfect. I haven't read much about this lake, but the southwest arm by the State Park looks pretty good from google maps! Any recommendation on lodging? Any input or suggestions would be appreciated. Thanks. Thanks for sharing your pictures! Looks like an enjoyable day. 90% pulling cranks with a cast here and there. No real ramp Greenheadrocker but lots of flat shoreline with pretty easy access. When water is cold I typically wear the water-proof socks or boots! What a beautiful day on the Little Sac on Saturday. Had to give up on the Red Sox at 2:30 in the morning so that I could make the 6:00 am wake up call! Put in at Orleans Bridge to find water temperature at 52 F....a little colder than I was expecting! 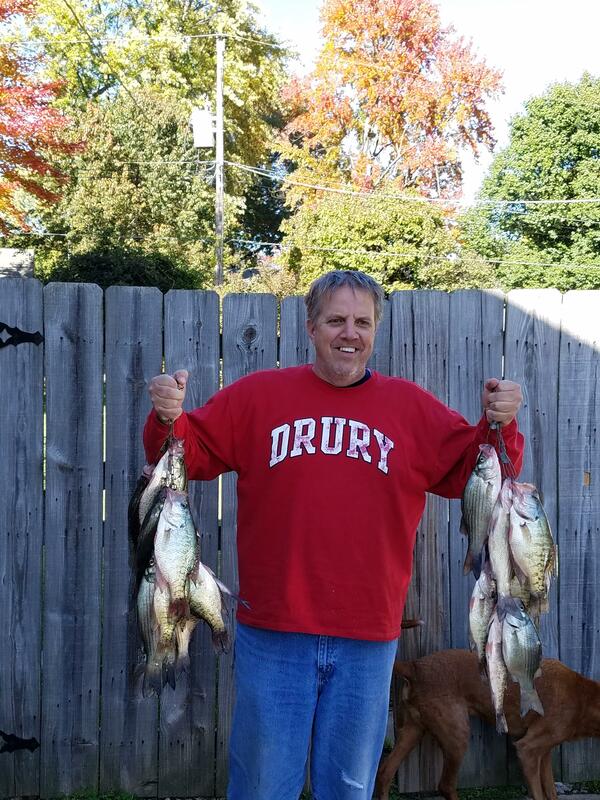 Caught whites and crappie pulling cranks and throwing a few jigs. Also pulled in 3 or 4 good largemouth. I guess there a lot of people hunting....we just about had the water to ourselves. I attached a pic from Saturday (Drury shirt) and also one from the same area in the fall of last year. Big and Small We Like 'Em All! No eggs iin either and I only remember looking at one belly...no shad....I figured it was hungry and that's why it went after my crank! Without eggs, I'm not smart enough to tell the difference between a male and female walleye. Had to work hard in the yak, but well worth it! Winds were 10 to 15 mph out of the NE. Started at Kauffman, moved to Turkey Creek, and finished at Maze Creek. There are so many good put-in locations for kayaks on Stockton! Pulled cranks for most of the day. Went home with 9 crappie and two walleye. Expected to find crappie in the shallows...that wasn't happening. I put in between the 160 bridge and where Turnback and Big Sac join together. Google maps identifies the road number as 380. 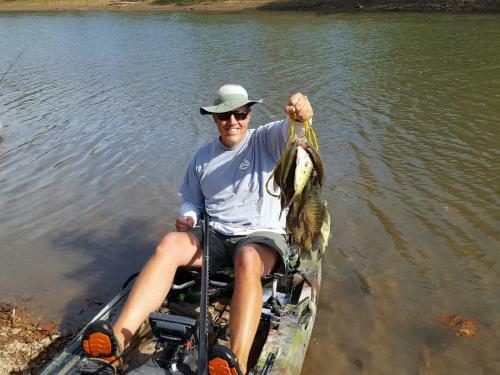 If you fish from a kayak, its a very good place to launch from....you can drive right to the water. Was fortunate enough to be on the water yesterday afternoon. A bit breezy and chilly but still fun! Brought home a 20+ inch walleye for dinner. Pulling cranks at Turnback area. Water temp had dropped to 48 F (was 54 last weekend). The shad balls were nowhere to be found! Caught 3 largemouth...17,16, and 13 inches...they are home safe and sound for someone else to catch. 54 degrees on the water temperature and pulling 100 series Bandits. The area of the river channel that I was in was between 7 to 10 feet. Just for your information, I went to Aldrich area yesterday and water temp was 53 F....it was quite stained! Moved up to Price branch where the water was clear, but water temp was 46F. Didn't do well at either place! The water at Turnback was not too stained and not too clear...just right in my opinion. Put in at 2 pm on Friday around the Turnback area. Brought home a couple of crappie and four whites. Water temperature was 54 F. Spent the entire time pulling cranks. Pitching jigs on a kayak in the wind can be a bit difficult! Also caught four good largemouth ( three of legal size) and a big drum. Was pretty excited to catch my personal best crappie on Stockton...it was 14.5 inches long. Looking forward to things heating up this spring!